Well, it has been nearly a week since we returned home to normal living instead of enjoying the tropical haven of Kauai. It has been a week of adjustment and not wanting to think that this is real life, but also being grateful for the wonderful time we did spend together with Dwight and Joanne in Hawaii. The sun has been shining this week, with the promise of snow for this coming Tuesday. It looks like I will be employed for a few weeks prior to Christmas with the Salvation Army having the task of matching people who are needing Christmas hampers with those families and organizations that would like to provide one at this Christmas Season. This will be something entirely new for me, but am looking forward to working together with a team of people and in an area that I have not been involved with. It will be stretching, I am sure, but I believe will also be good for me. Not much else on this front. We are starting a new book at our Small Group entitled Velvet Elvis by Rob Bell. It is one of my favorite books so was so good to start re-reading it again. Will also be doing a book study with some women on “Women Food and God” by Geneen Roth. I am sure there will be some good discussions out of this book. Also just finished reading the book “Mennonite in a Little Black Dress” by Rhoda Janzen. It was amazingly hilarious but also well written and respectfully written. Enjoyed it thoroughly. Now back to life in Saskatchebush!!! Well, it looks like we are in the last couple of days of our vacation at Kauai. The time has slipped by so quickly and it is hard to imagine that in a couple of days we will be back in cold Saskatchewan. The last couple of days have been spent relaxing, reading and enjoying the sun and waves. All of us have read at least two books and have loved having no time pressures at all. Yesteday afternoon Joanne and I spent the afternoon at the pool enjoying the sun and the breeze from the water while reading our books to our heart’s content. Jerry and Dwight did the shopping for people back home and prepared our evening meal for us…barbacued chicken and potatoes and vegetables…it was awesome…probably because Joanne and I didn’t have to prepare it. Today we are heading to Poipu Beach and then to Hanapepe where we have made reservations for dinner tonight at a unique little restaurant. Hanapepe is a unique little artsy town with quite a history and many of the stores date back to when the town was established and has now been turned into quite an artsy place where you can see anything from pottery to photography to woodturning to old books! A great little place to saunter through and enjoy all the unique local artists. Tomorrow evening we start our journey back to Saskatoon…long stopovers at numerous airports but will have good books along to read. Our flight from Kauai is a “red eye” flight so hopefully will get some sleep along the way. Have thoroughly enjoyed our time here. We were talking about what would be our ideal vacation and I said doing exactly what we are doing. It has been absolutely relaxing and amazing! We have enjoyed every minute and will continue to until we get on the airplane to head home. Aloha! We have had some busy days here on Kauai! Our friend Jen came to join us for the weekend and we had so much fun. 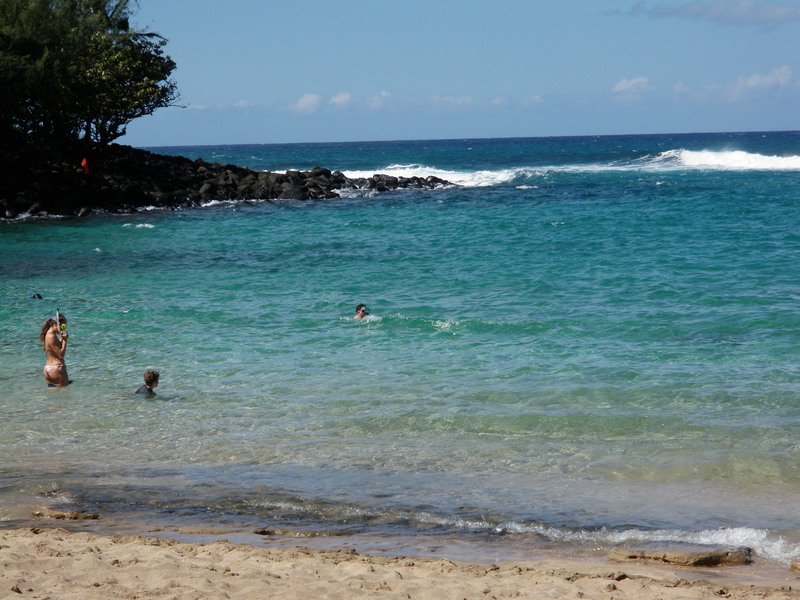 On Friday we went down to Salt Pond Beach…an amazing beach with lots of surf. Jerry went into the water but the rest of us just sat on the beach and enjoyed the beautiful view and the sunny warm day. Jen came in the evening and we went out for supper at a neat outdoor restaurant in Koloa at a beautiful spot where we could enjoy great conversation and great food. 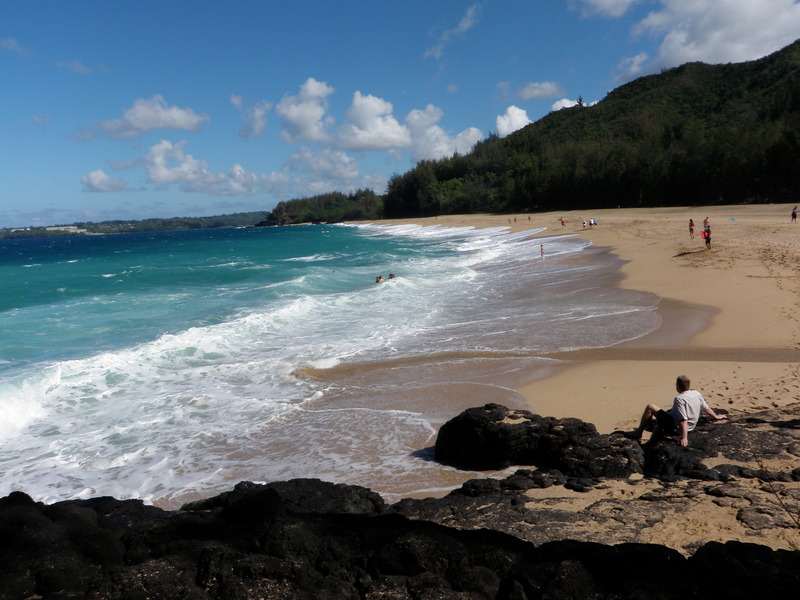 Saturday we hopped into the car and drove to the Ke’e Beach, the end of the road beach which is absolutely amazing. We hung out there all day, walking the beaches, enjoying the waves, Jerry and Jen snorkeling, exploring the tunnels and eating at Kalypso where we started out with Lava Flow drinks…amazing! Long drive back to our condo but all in all it was an amazing day! Sunday was Football Relaxing Day and we hung out around the cliffs watching the waves and Jen trekked and found all kinds of places to take some amazing photos. We enjoyed a great barbacued meal in the evening and enjoyed a relaxing evening. Monday we headed out to Waimea Canyon a spectacular and we headed up to the end of the road to enjoy the panorama view of the ocean and looking hundreds of feet down to the ocean. We watched helicopters come in with their sightseers but we could hardly make them out at the ocean shore. We ended up at the Shrimp Shack at Waimea town for coconut shrimp and french fries…the best on the island. Jen then realized that she had some problems with her flight that she had booked, and would be leaving a little earlier, so we headed back to the condo and then took her out to the airport to head back to Maui. We had received a call from our car rental place that we needed to bring our car in for some reason, so end of the story we ended up with a different vehicle, a van this time, which makes for great sightseeing. Tuesday was spent just hanging out with enjoying a great lunch in Lihue outside on the lanai overlooking the water, of fish and chips and crab cakes…delicious…but lots to eat. The rest of the day was spent relaxing and an evening of playing cards…which is always fun….and we are always glad nobody knows us or can hear us!!!! Today huge waves as the trade winds are blowing hard…downpoured during the night so very humid and warm today. Just returned from watching huge waves crash on the cliffs…amazing! Now to another day in the sun and embracing the beautiful weather. There is a blizzard back home in Saskatchewan which makes it even seem more beautiful here. We are taking it easy today with Joanne icing her knee and resting…she is hopping around on one foot to get around as it hurts too much to put weight on her left knee. Jerry and Dwight headed out to check out some car stores and do whatever guys do when they shop. Our internet will be done later this afternoon so not sure if I will finish today’s blog or not! Cannot believe how behind they are here with no wifi…never even thought twice that we wouldn’t have it. Oh well, just less computer time. I still have my blackberry and can message and read all my email so not complaining. Will post pictures once I have downloaded them from our camera. We were up early as usual…packed the car…and set out for Donkey Beach which had been recommended to us by a local fellow who sat beside Dwight on the flight to Kauai. It took some navigating but we did find it…it was a hike down to the beach but it was well worth the effort. Again, nobody on the beach and it was absolutely magnificent. Jerry and I walked the whole cove and it was amazing. 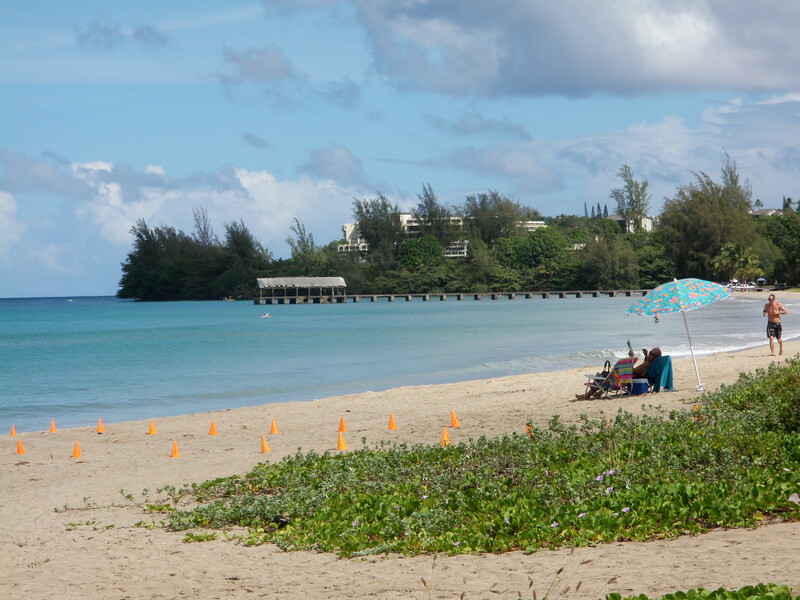 We actually saw monk seal up on the shore…a smaller monk seal coming up for a rest! Apparently they are getting rarer and rarer and there are only about 1,000 of them left! We kept our distance and allowed him/her to relax in the sun and enjoy the beach like us. Lots of waves again and this time Joanne got knocked down with a strong wave…she ended up twisting her knee and by the time we arrived back at the resort, she could barely walk! We iced it and the rest of us waited on her!!! Spent another quiet evening at home watching the Texas New York baseball series. They were happy New York lost!!!! We are a little disgusted with the internet access here. No wifi and we have to pay $10 for every connection per day…hence I will not be posting every day but trying to cover two days with each day connection! We did skype both of our kids and they saw their dad for the first time without a moustache…too funny…not often we hear Tamara react the way she did…too funny…and Matt couldn’t stop grinning…it was priceless!! We got to see our Chela Bela and Joanne had the opportunity to check out Benny’s braces on his teeth. We got to message with Tash in BC and she indicated there were two little men who were missing their grandparents! Hoping Joanne’s knee heals…lots of ice, rest and no walking for a couple of days!!! We are still getting up early as our body time clocks are slow in adjusting to the time change. It probably works best for me as I am not a morning person and now am waking up early and ready for the day!!!!! Jerry wanted to try out snorkeling again…this time without his moustache!!!! He has not been without a moustache in over 35 years so this was quite a move for him to shave this part of his person!! It certainly improved the snorkeling as he didn’t get any water into his mask and was able to spend lots of time in the ocean without swallowing a bunch of salt water! 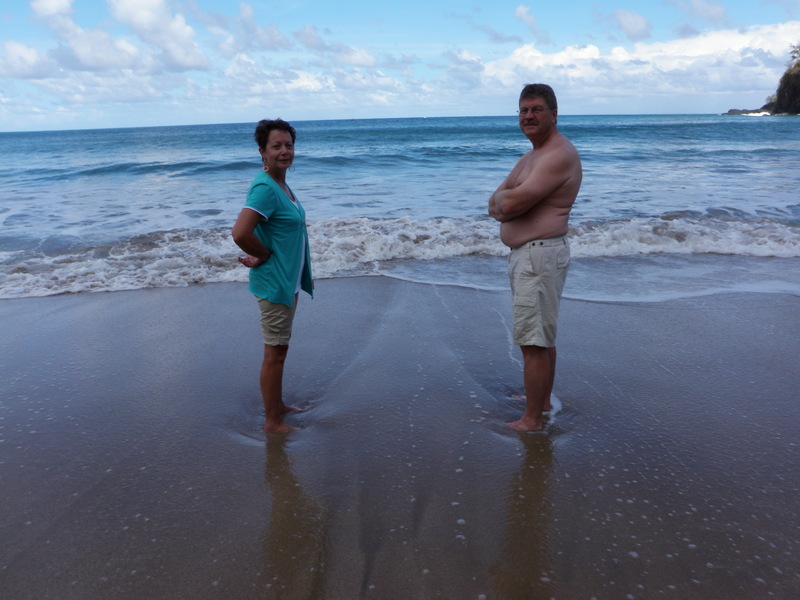 Joanne and I walked Poipu Beach looking for fish with no luck…Joanne and Jerry found fish a little further down the beach…I missed them!!!! It was a beautiful day with a strong breeze and awesome sun! Dwight still is not feeling well from his cold and Joanne is fighting one as well. Dwight’s back goes out when he has a coughing spell, so lots of fun! Dwight picked us up and we quickly changed and headed out to the Koloa Farmers Market where we picked up fresh pineapple, mangoes, papayas, bananas, sweet corn, cucumbers, avocadoes, oranges…all grown locally…so good! We came home and Jerry, Joanne and I headed back to Shipwreak Beach…a 5 minute walk from our resort…and we spent the afternoon enjoying the waves and the sun…enjoyed watching the locals riding the waves…some on surf boards and some on boogie boards…and one dog enjoying the waves with his owner…too funny! We made an amazing supper with barbacued chicken, salad and sweet corn! Dwight and Jerry always enjoy the cookies and sweets for dessert! Evenings are short as we are tired early and head to bed! Sunday was our down day as the boys had their football day which started early in the morning and lasted most of the day. We also headed to Lihue to pick up our groceries for the next couple of weeks at Walmart and Costco. We started out with lunch at the Deli in Kukui Grove Shopping Center and then headed to the bakery for something sweet for the boys!!! This was a slow day and we pretty well took it easy! We packed up our belongings as we had to be out of our place by 11:00 am…we were up early again as we still hadn’t adjusted to the time change of 4 hours for us. We headed out to Hanalei Bay another beautiful Beach…we walked the sand and saw the historical pier that was on the movie “South Pacific”. Every time we visit Kauai we stop at the Hanalei Valley Lookout which is absolutely beautiful looking out over the taro fields, the local crop grown here! We then headed down towards Poipu where we would be staying for the rest of our vacation. 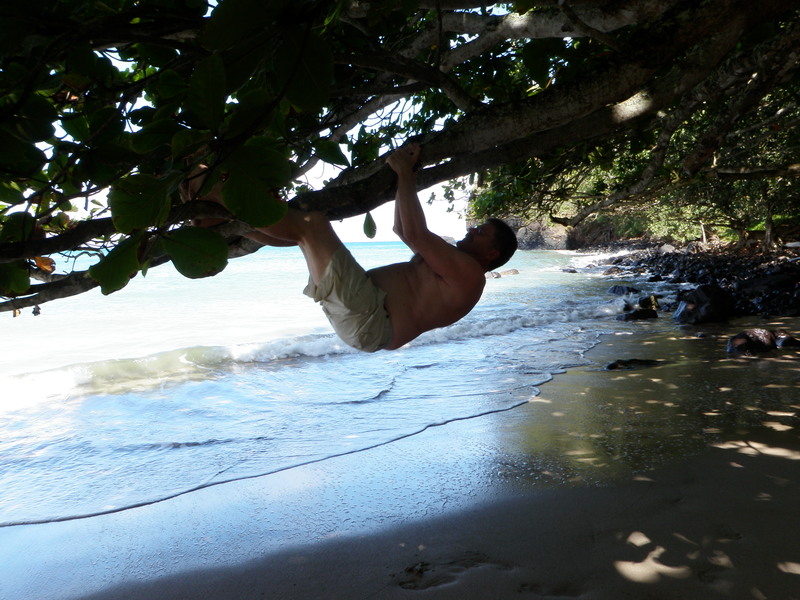 We stopped at Anini Beach Park where Sylvester Stallone has a huge property, but noticed that this year there was no sandy beach as the water was high. The beaches here change over time with the change of the water tides. The first time we came here with Lorne and Doris we found this little beach we loved and again we stopped there and walked the whole beach…a little cove…again with hardly any people there…Joanne, Jerry and I walked the entire beach as Dwight slept in the car as he was dealing with a bad cold! It was a beautiful way to spend the morning…another awesome day at the ocean. 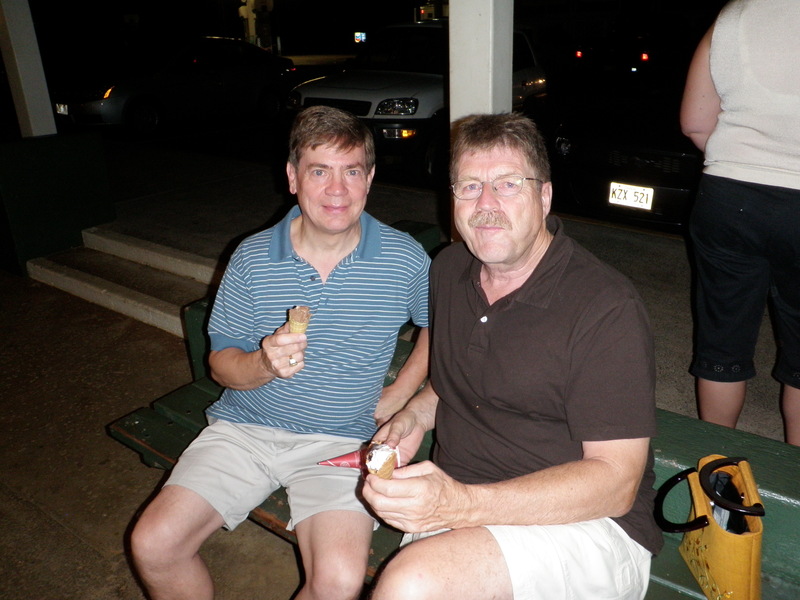 We then headed to Lihue…stopped at a roadside market where we picked up homemade mango loaves, mango pie and banana cream pie (diet food)…Jerry and I also had a type of tapioca pudding made with coconut milk…they were also roasting chicken, potatoes and boar smoking on open coals. Before we checked into our resort we went to our favorite local restaurant in Koloa and ordered pizza…it was amazing and we enjoyed every bite!! We then checked into our resort and settled in for the next couple of weeks. In the evening we walked along shipwreak beach…watched the locals surf and Joanne was “blessed” because she saw a whale…at least 6 sightings of breaching whales and blows…too awesome…actually we all saw the whale sighting,..a great way to end our first Saturday!!! We got up really early as we had gone to bed so early and we headed up to Ke’e Beach which is the end of the road beach on the north shore. It is absolutely beautiful and the awesome thing about being here early in the morning and on Kauai Island anywhere is there are almost no people. We walked and walked the ocean short and there was nobody on the beach but the four of us. We met a person here and there as we walked, but it absolutely wonderful to be back walking the sandy beaches, hearing the ocean roar, see a few fluffy clouds and have the sun shine bright on us. We spent most of the morning there…Jerry, Dwight and Joanne went into the water and did some swimming, but since I had forgotten to put on my swimsuit bottoms I was relegated to sitting on the chairs on the beach. I have a funny story of how I did get some rays without my swimsuit bottoms, but you will have to ask me personally about that story!!!!! We then slowly made our way back to Princeville stopping at all the beautiful bays and beaches along the way…stopping for a mango smoothie…delicious…we stopped at Ha’ena Beach Park, Tunnels Beach…stopped at Wainiha Bay and Lumaha’i Beach where Joanne and I climbed up on the black lava cliff and watched the waves crash on the shore…saw some young guys surfing…which is always fun to watch. We then went home…and those who had the privilege of swimming had showers…and we headed out for dinner…ending up in Princeville Centre where we had an amazing meal of cajun seasoned freshly caught fish of the day! 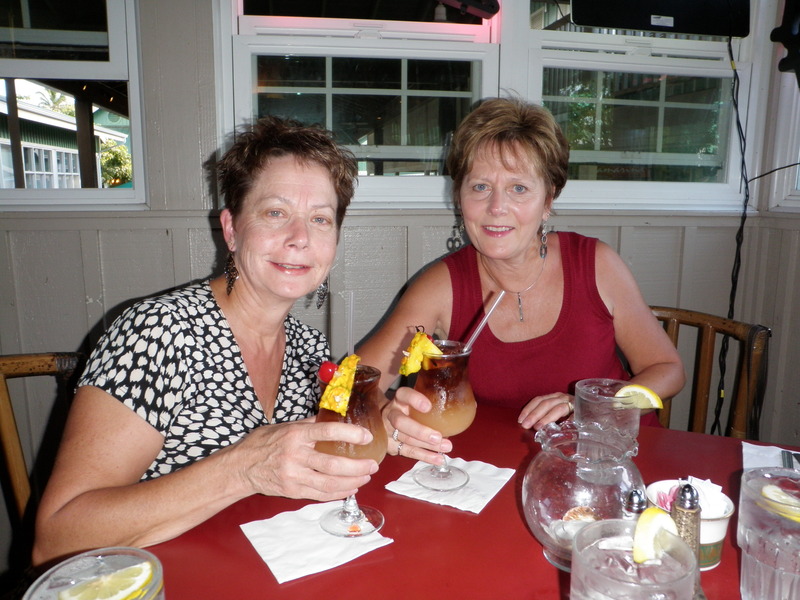 Don’t ask me about the Mai Tai I had…more than this “old girl” to handle but it was funny!!! Of course we had to do our daily ice cream stop for Jerry and he loved every lick!!!!! Back home for another early night…we were exhausted. 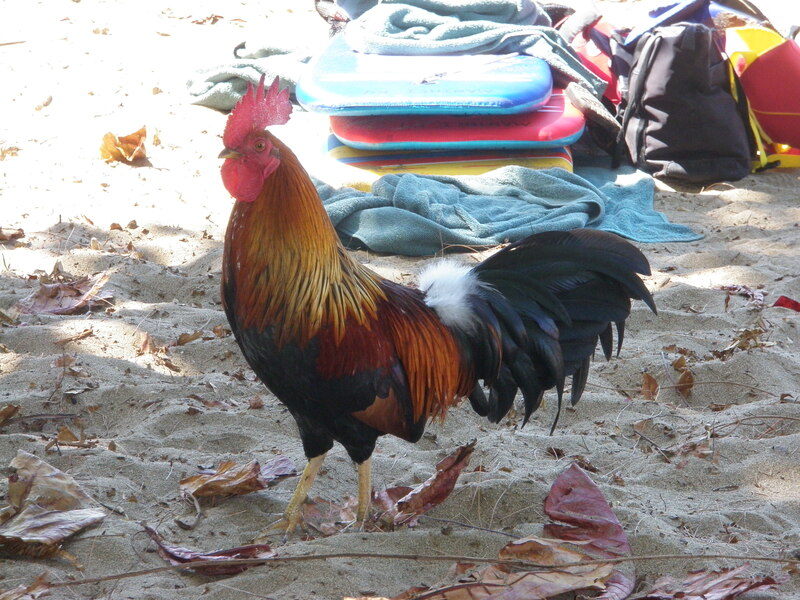 Roosters run wild on the beaches in Kauai! I usually like to blog my holidays as it is a great way for me to record what we have done and also I can then go back and relive the holiday over and over again in the future. 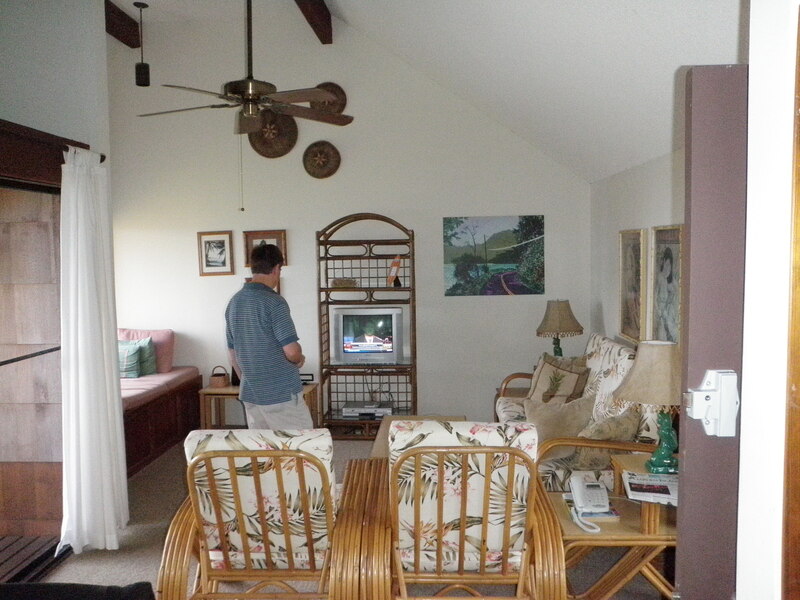 So again, I am going to try and blog our experiences and what we have done during this holiday time spent in Kauau with my sister Joanne and her husband Dwight. We left from Saskatoon on Wednesday, October 13th and flew to Seattle where we spent the night. The flights were good and we had a nice clean hotel…went to bed early as the alarm went off at 3:15 am as we had to catch the shuttle to get to the Seattle Airport to catch our 6:00 am flight. I had checked-in at home so we had our boarding passes all in place so the airport check-in was quick and painless which was nice. We then flew to San Francisco where we met up with Dwight and Joanne. We were there welcoming committee as they got off their flight as we arrived earlier than them. Joanne made sure she had her famous clam chowder at the soul restaurant and then we headed to catch our flight to Lihue, Kauai. No problems boarding, but had forgotten how long the flight was to Hawaii…5 1/2 hours sitting in airplane seats is not fun. Had started a new book by Carlos Ruiz Zafon “The Angel’s Game” so read quite a bit in it and the rest of the time “patiently” waited for the flight to be over. The amazing thing about the flight…there was a family with two children sitting across the aisle from us and the grandmother was sitting beside me…there children were a little girl 8 months and a boy about 3 years old…and they were amazing. The little girl never fussed at all and the little boy was amazing on the long flight. Joanne and I wondered what our grandchildren would be like on such a flight…not as cooperative we think!!!! We landed and then went to get our rented car…we were hungry so ended up at one of our favorite restaurants…Duke’s at the Marriott in Lihue…awesome food and we had to start our holiday with our favorite dessert…huge piece of ice cream pie with hot fudge macadamia sauce…too delicious…then we headed to Princeville where we were staying the first two nights of our stay in Kauai. Had trouble finding our condo but finally did and we settled in for a couple of days on the north side. We went and bought some groceries, ate a light supper, and then headed to bed as we were so tired after the long day. So ended our first partial day on the island of Kauai! !